Kitsch knitwear is in vogue like never before this winter season. So, it means you don’t have to nag your little ones about wrapping up warm against the plummeting mercury levels. J Crew’s red llama jumper with its crystal embellishment is playful and tongue in cheek. For her, I love this fairisle sweater from Trotters, which goes with pretty much everything. It can even be worn into the spring, with a pair of denim shorts and flat ankle boots. Cosy, cuddly and the next best thing to taking a blanket out with you this winter, faux fur coats have made another come back. They were last hugely popular in the 1990s when they were worn with a slightly grunge vibe. But, this time around, faux fur is much more grown-up and glamorous – although that’s not to say it can’t be for your little ones too. I'm going to be treating myself to the faux fur version by Soft Grey, which will be the perfect warm cover-up for my LBD. But I can still wear it on casual days with boyfriend jeans and a pair of biker boots. While, for my little girl, this button up version will mean she’s the envy of her friends. She can wear to her school party or with jeans for the weekend. This winter, the must-have hue has been pink, particularly when it comes to outerwear. Oversized pink duster coats were seen all over the catwalks, which spawned high street versions, many of which sold out. But, next spring, one of the key shades is blue – and not just any blue, but a striking cobalt blue. This electric blue puffer coat from Timberland is perfect for little boys. While, for me, I've fallen for this Marc New York double-breasted number with its military detailing and button-down collar. A crisp white shirt will always be a key wardrobe staple – perfect for tucking into a pencil skirt for work or for wearing with a pair of jeans for an easy off-duty style. But, this season, the print shirt has been hugely popular. Burberry’s heart print motif has been worn by Victoria Beckham, Harry Styles and Paula Patton. But I love this floral print shirt from Paul Smith, which takes a key look for winter – dark-hued blooms – and puts it together with a classic shirt shape. For little ones, Liberty London’s butterfly print shirt will go with leggings and mary janes. Logo print pieces have been huge looks on the spring/summer 2014 runways, with designers including Alexander Wang, Dior, Kenzo and Christopher Kane sending their models down the catwalks adorned with logos and slogans of all descriptions. Independent boutique Cute Graffiti has a sweet range of slogan tee’s including this one which has a funny take on the well-known phrase Respect Your Elders. Zoe Karssen for Boutique 1 has a range of adults printed tee’s which doesn't take itself seriously. This Créme de la crème shirt is my favourite. While once there were clear distinctions between what mother and child wore, now the lines are blurred. I'm just waiting until my daughter grows a little more, then I’ll be stealing the items from her wardrobe instead of the other way round. Katie is a Yorkshire based blogger who writes mostly about her adventures in food, fashion and on foreign shores. You can find her on twitter. Trendy Thursday - The 2013 Round Up! 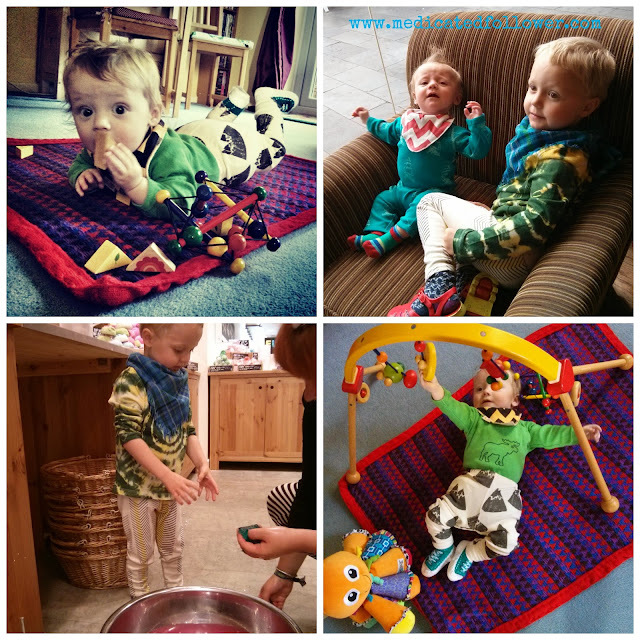 Lovely Emma from They Grow So Quick has been joining in with my Trendy linky for a loooong time now. I always love her posts, I love that she has two boys like me, and a really similar taste in clothing. 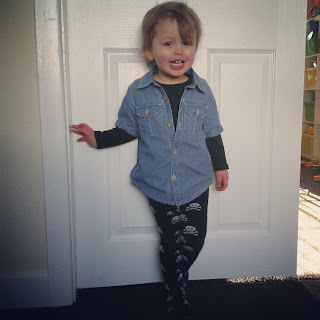 Her boys always look awesome, but overall, I really love the post in which she shared Seb's denim shirt. It reminded me that Ethan didn't have one and had me heading out to the shops to find one for him. Love to be inspired! Up next we have the lovely Kara and her gorgeous daughter Addison. Kara has a real eye for fashion and her three gorgeous children have just the right balance of cute and trendy in their outfits. 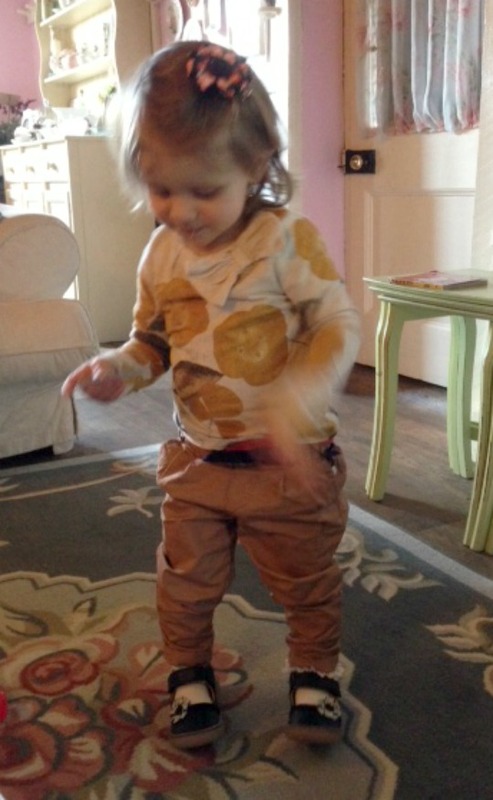 I love this outfit of Addison's that Kara shared with us back in April. It's cute, but the dark colour of the shoes balances it. I particularly love the trousers! 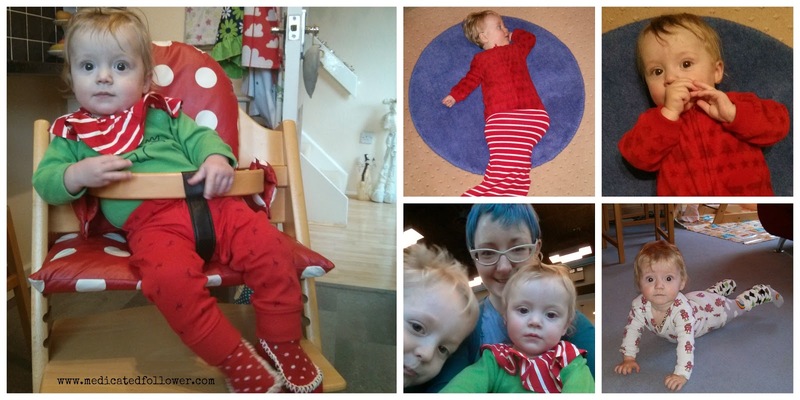 Sarah of Mum of Three World started joining in with the Trendy linky earlier this year and has become a regular - thank you! Her daughter has a great style and as she's a little older than a lot of the other children featured in the linky, it's especially interesting seeing what she's wearing because she is a lot more involved in choosing what she wears! 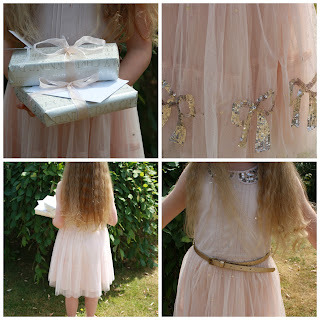 I adore this beautiful dress that she wore for a Christening in July. Delicate and striking in an understated way! Emma from Bubbablue And Me is another long time Trendy buddy. She has a classic taste. I think it's fair to say that her taste and my taste are different. Mine a little more out there I think!! Still, I love to see her posts. Her little man always looks lovely, well dressed and comfy. Emma picks some lovely trousers for N and so I've picked her post on chinos. Love the colour! Hannah of Make Do and Push joined in with Trendy for the first time a few months ago and I adore her style. It's so lovely to have new bloggers joining in. The outfits she puts together for her gorgeous Busby are so bright and funky. 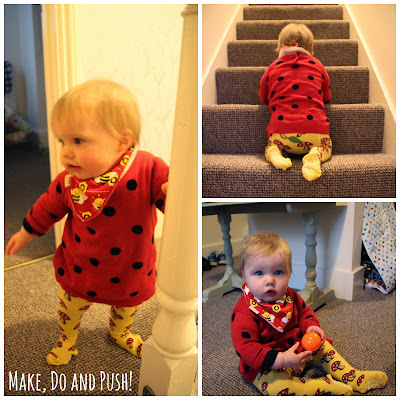 Like me, she's a lover of Slugs and Snails tights so I had to pick this post of hers! Finally, we have Claire of What Elsa Wears. Oh, I DO love a blog all about what a child is wearing. This is a blog after my own heart! I had to pick this post showing Elsa's Christmas jumper collection. What a collection!!! I think the snowflake print is my favourite. That completes my round up! I've got the linky live, so link up any outfit posts you have for this week if you like. I want to thank everyone who has joined in with Trendy Tuesday/Thursday this year. It really means so much to me. It's such a small linky but I do love it. It makes me so happy to see people linking up and even if it takes me a few days, I do try to get to everyone's post to comment. Children's fashion is my passion and I love sharing it! Trendy Thursday is taking a break now until the new year. I look forward to seeing you back and hopefully a few new faces as well! Felix went down for his nap this morning and I set myself up at my laptop, coffee to one side, phone to the other, radio on blaring out the Christmas tunes. What should I write? A few things popped into my head, there are a few child rearing type issues I want to write about. Of course, there's Trendy Thursday, but that's a few days away yet.. But, I thought, at this time of year, all we really want to read about is Christmas! Well.. most of us, anyway! Who wants to read my thoughts on how Baby Led Weaning is going, or how Ethan is getting on with Felix these days. So... that's it. I give in. I'm just going to blab on about Christmas for a bit. You've seen the festive clothes.. we're all rocking them, almost on a daily basis now! Ethan hasn't broken up from school yet, not until Friday, but there is definitely a more relaxed feeling at school. The teachers are wearing Santa hats, there are decorations up. He has a Christmas Party at school tomorrow morning and then I get to join him in the afternoon for a table decoration craft session. Quite excited about that! I love some one on one time with my big boy. The tree has been up for two weeks. It's dropping needles like a... well, like a tree that has been up rooted and stuck in a warm living room!! Thank goodness for my hand held vac. Christmas cards are arriving in the post, despite the ever increasing costs. I've even managed to send mine. The presents have been bought but are yet to be wrapped. When do you wrap yours? Do you have a Christmas Eve mad wrapping session (ehem, tradition? ;-D). Talking of traditions; what are yours? I don't think we have many, but I suppose we do without really thinking about it. The same decorations coming out each year. There's this horrible singing Santa that my Mum bought us years ago that everyone hates... and yet, it comes out every year to torment us. Many of our traditions are Christmas Eve based. The boys will have new PJs (quite a few people do that!). We sprinkle "reindeer food" for the reindeer in the garden. We put out the plate of mince pies and sherry for Father Christmas and a carrot for the reindeer. Love that someone has the job of drinking and eating (or at least biting at!) those. I believe that always fell to my Dad as we were growing up. Now I think Pete and my Dad share it (we always sleep at there house on Christmas Eve). On Christmas morning, it's all about stocking opening. One of my favourite memories of Christmas is a child is that feeling as you wake in the early morning. The feeling of the heavy stocking lying on the bottom of your bed, maybe resting on top of your feet a little. It was always so exciting!! Growing up, my brother and I were always allowed to choose one present from under the tree after we'd opened our stockings, to "keep us going" until the big present unwrapping session. I always got clothes for Christmas so I'd choose the parcel that felt the most like clothing in the hope that I'd be able to put my new clothes on! Post Christmas lunch, we have a quiet time. Before the Queen's speech. I think it's the same for many of us! As a child I would go up to my bedroom. "Father Christmas" always bought me a new audio tape in my stocking so I would put that on and drift off. Something like Rebecca or a new Dickens. Lovely. Do you have Christmas traditions? I'd love to hear them! 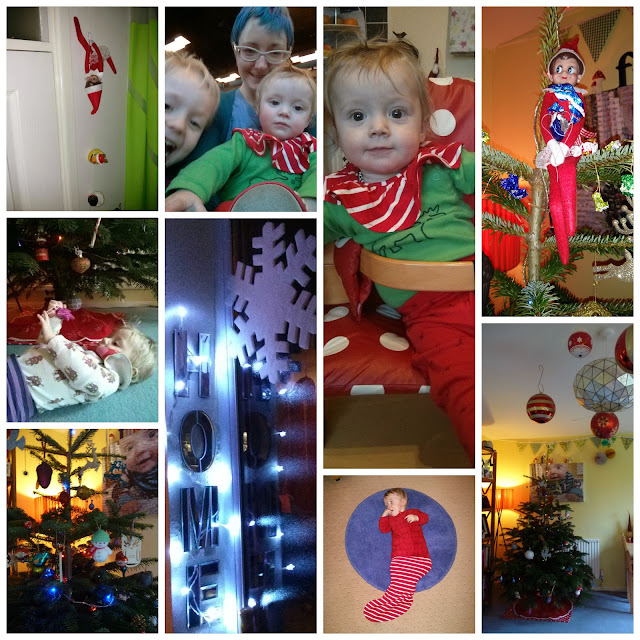 I expect my blog will be quiet for a while now until January takes off. I'm planning a Trendy Thursday for this week, a round up of some of my favourite outfits from the year from those who've linked up. Apart from that though, I'm going to take a couple of weeks off. Enjoy the time with my family and away from time keeping and deadlines. So, I wish you and your family a very VERY merry Christmas. Enjoy. Here's to 2014!! 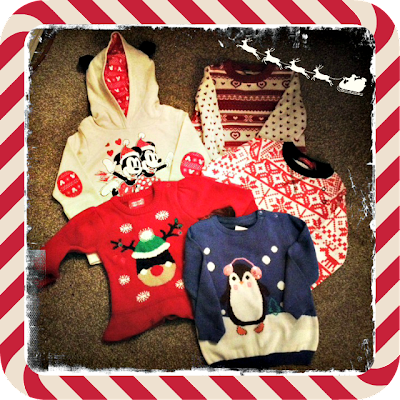 Trendy Thursday - Christmas clothes for baby! 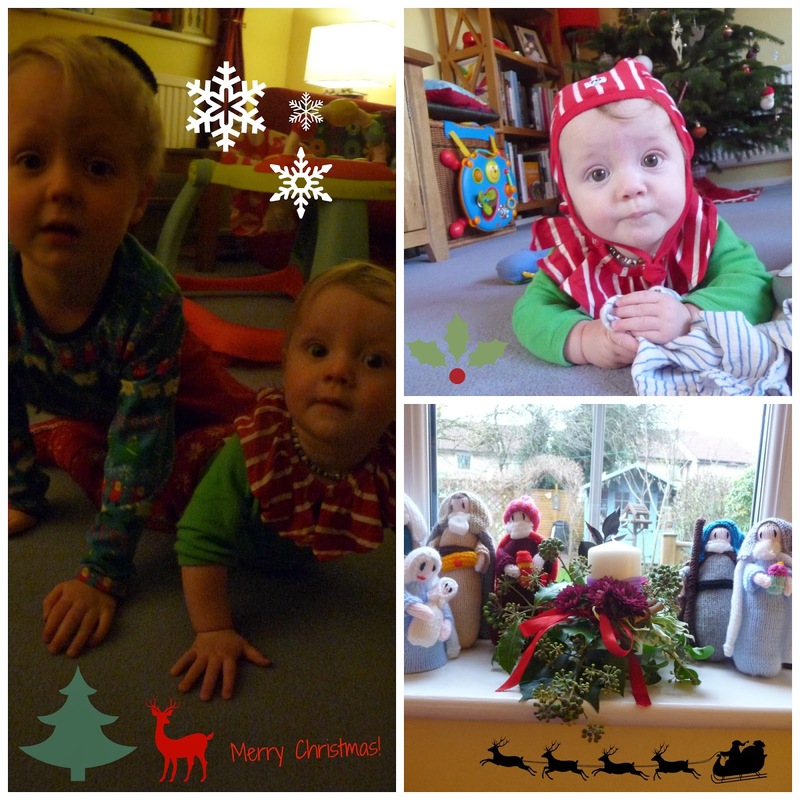 Well, I warned you that we're getting our Christmas on in our household, and it's true.. well, for the boys and I, anyway! I believe last week I mentioned that Festive Felix would be getting his turn in the spotlight? He's certainly been rocking a seasonal selection in the last week! There are so many cute Christmas outfits and North Pole infused pieces for children these days. Really, we're spoilt for choice. I don't think it's worth spending too much unless it's something like a hat or leg warmers that they might be able to wear for a few years on a row. So.. I have tried to be restrained! Still, there are some real bargains out there and because they are so cute, it's hard to resist! Primark is a good place for budget seasonal items. It's a little harder if you have a baby boy I find but it's always worth a look, even if Primark is rather reminiscent of a jumble sale! I found some leggings for Felix in the girls section. No reason why they can't be worn by a boy, especially if they are only setting you back a couple of quid! F&F clothing at Tesco also has an extensive range of seasonal wear this year. 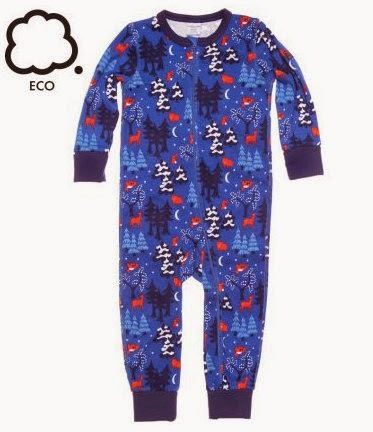 I got an adorable fleece sleepsuit from them, red with a Nordic style print. Polarn O Pyret have a beautiful new print this year called Nordic Nights. I think it is absolutely beautiful. I grabbed a sleepsuit in this print during their 20% off sleepwear & free postage deal the other week (I was also able to use my 10% off voucher - bargain!). PO.P are fantastic for festive threads; their classic red and white stripes look Christmassy but can also be worn all year around. They have some fun items like braces, bow ties, and my favourite, neck ruffle/collar. OK, it's a bit silly, but it's also adorable! eBay is another place I always check for a festive bargain. I love leg warmers for the boys. Ethan doesn't wear them much these days but they are still very handy to have around. You never know when you might need an extra layer of warmth on your legs or arms and they tend to be one size fits all (though of course, the bigger you are, the smaller they will be on you!). I recently bought Felix a pair with Christmas Trees on for a couple of quid on eBay. Join in with the Trendy Thursday linky! Write up a children's fashion blog post, link up below, tweet me and visit others who join in! I've come to a conclusion. At first glance, it might seem a somewhat depressing, but very often, I feel the lower your expectations of something, the better the reality actually is! Let me be clear, this isn't something I apply to everything, I love looking forward to a holiday or anticipating how wonderful a coffee and cake will taste, but often I feel if you don't expect much then you can enjoy more! Let me apply that to today. A few months ago, I received an email from a PR working for Andrex. They were getting in touch to offer me a free spa day. In return for nothing. Not even a tweet or Instagrammed pic. Of course, I jumped at the offer. A spa day? For free? Some time away from normality? Hell yes! I didn't want to get too excited though. Didn't want to get my hopes up as it were. Why? Well, things often fall through. Especially when you have young children. At this time of year, when the world is rife with colds and viruses, you never know if you are going to be able to commit to something! It was entirely possible that one of the boys could be ill, or even my parents who were "booked" for babysitting duty. Or I might be ill! Or the event might be cancelled. In my experience as a blogger and a parent, you have to expect the unexpected, be flexible and above all, not hang all your hopes on something. In the end, despite winter's best efforts to make everyone in the family ill, it all came together. I got my time away from the school run. 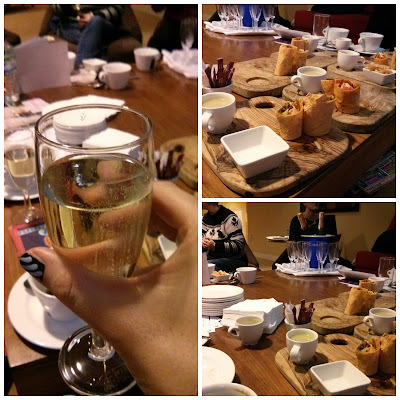 I got to spend a lovely day with some fantastic ladies and best of all, I got to drink champers and have my back massaged in return for nothing. 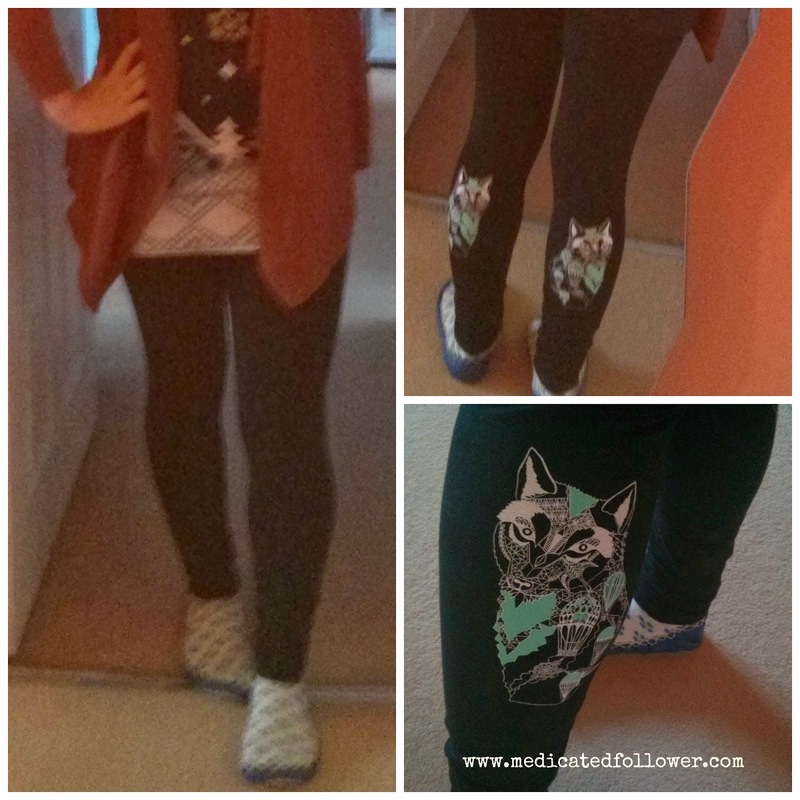 Trendy Thursday - Christmas clothes are go! My poor little Ethan has been really poorly recently. A horrible virus. High temps, fevers, coughs, rashes, aches and pains. Poor sausage. At the weekend we bought our tree. We've always gone out and chosen as a family and had been really excited about doing so as a family of four this year. Ethan wasn't feeling up to leaving the house though, but insisted we get the tree as "I want to see it sparkling when I'm poorly". Bless him. Mum and Dad came over so Pete and I could pop out to get the tree. It was weird going out without either of the boys (Felix stayed behind in the warm as well). 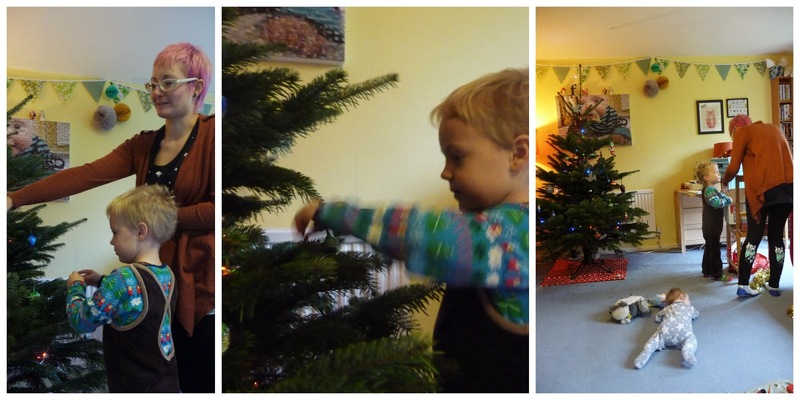 On Sunday we put our tree up as a family. Ethan still wasn't well but he had enough energy to help with a few of the decorations. I'd dressed him in something soft and comfy and a little festive. A pair of Krutter velour dungarees and a Christmas print Smafolk top from last year. I think he looked as cute as cute can be! Are your kids rocking any Christmas prints yet? Just wait until I post some of Felix's stuff next week!! Link up below, tweet me, comment here and visit the others - have fun!! Salt City Emporium - the best leggings for women and kids? I've become a little obsessed with leggings in recent years. I adore how comfortable they are, and how versatile. The trouble with leggings, though, is that if you aren't careful, you can look a little slummy. A little like you don't care. And I do care! Of course I want (need?) to be comfortable. That's a necessary when dealing with small children. All that bending down, picking up etc., you want to be comfy! You don't necessary want to look like you've just walked off the set of The Jeremy Kyle Show though! For that reason, I love the recent trend in patterned leggings. As long as you wear them with a reasonably plain/block colour top or dress they look great, look on trend, look interesting but most of all, look like you've made an effort whilst being comfortable. Score! and a pair of the Wolf Hot Air Balloon leggings (love the idea of being "all business" up front and party behind - the design is on the back!). Something to note - they use fantastic materials in their leggings that wear really nicely. 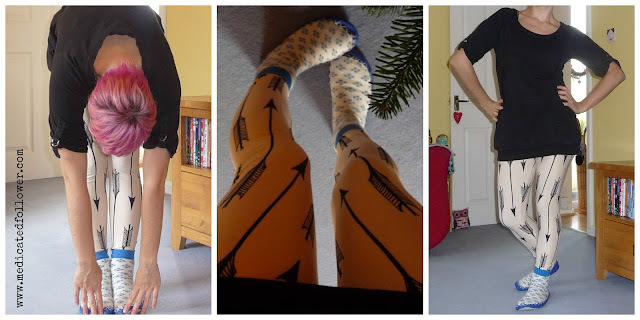 The arrow print leggings are a mix of polyester and spandex and they cling really nicely. I wore them two days in a row and didn't get any of the bagging/sagging around the knees you often get with leggings. The wolf print are cotton and elastane American Apparel leggings - so you know you're getting great quality there! I also wore these two days in a row and they didn't go baggy. I measured myself according to Salt City's measurement guidelines and ordered medium in both pairs - I think medium was the right choice for the Arrow Print due to them being a tighter more clingy material. The American Apparel leggings come up a bit bigger I feel, so I think small would have been a better fit for me there, just to get the streamline look I prefer. The medium is OK, still wearable, but small would have been better; so, something to bear in mind if you end up ordering. Both pairs look lovely and slimming though! I love that I can wear the same brand as my boys. I can't wait for the day all three of us are rocking our Salt City threads together - shame hubby can't join in at the moment - maybe a scarf/t shirt range for the men would be a good idea? I don't think hubby would be to keen on rocking leggings (mind you, he wears them to cycle in!!). Linking with Transatlantic Blonde, Pleated Poppy, Rachel The Hat & Lena B.